Fascist Italy's most lethal WWII aerial asset, S.79 torpedo-bombers "became almost legendary, making the aircraft as famous to the Italians as Mustangs, Spitfires and Messerschmitt were to the Americans, British and Germans, respectively." 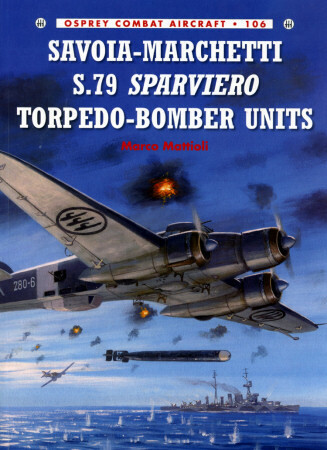 Now Marco Mattioli recaps that story in his excellent Savoia-Marchetti S.79 Sparviero Torpedo-Bomber Units – number 106 in Osprey's acclaimed "Combat Aircraft" series. Popularly dubbed "gobbo maledetto" ("damned hunchback") – and officially called Sparviero ("Sparrowhawk") – fast, maneuverable S.79s forged a reputation for rugged reliability. And author Mattioli methodically chronicles – year-by-year, unit-by-unit – its use in Regia Aeronautica torpedo-bomber roles. The aircraft's Aug 1940 combat debut against Royal Navy targets at Alexandria, Egypt proved inconclusive. But the next two years underscored its anti-shipping excellence. With ascendant Allied airpower, however, a litany of losses confirmed the S.79's growing obsolescence by late 1942. And with Italy's mid-1943 capitulation, the dwindling number of survivors soldiered on as transports with the Italian Co-Belligerent Air Force in the south – and as torpedo-bombers with the Mussolini's rump Aeronautica Nazionale Repubblicana in the north. Including informative introductory notes, Mattioli's terrific tale spans five chapters and 96 pages. Action summaries recap participating units, aircrew, S.79 serials, casualties, equipment losses, and enemy vessels and tonnage destroyed and damaged. Personal accounts and absorbing anecdotes sumptuously season the study. Expect some surprises, too. Did you know that world-famous fashion designer Emilio Pucci, piloting a 41˚ Gruppo S.79, sunk two ships in June 1942? And Mattioli's account of 104˚ Gruppo Tenente Mario Ingrellini might just intrigue students of the paranormal. Photos and extended captions flavor the account. Richard Caruana's superb color plates with painting notes provide plenty of modeling inspiration. And four appendices and an index neatly wrap things up. My biggest disappointments? This otherwise excellent little book contains no bibliography – and no annotations. So you're on your own for further study. Still, I thoroughly enjoyed Osprey's effort. It superbly summarizes an oft-neglected facet of World War II air combat. "In the torpedo-bomber role the S. 79 proved to be an insuperable and outstanding aircraft," Mattioli notes. Make his ripping little read your introduction to Fascist Italy's premier airmen – and their main mount.